Property Distribution Category Archives — New Jersey Divorce Lawyer Blog Published by New Jersey Divorce Lawyers — Aretsky Law Group, P.C. The Associated Press has reported that the wife in an Illinois divorce case—Nancy Riddle v. John Riddle—filed an emergency petition with the court. What was the emergency? 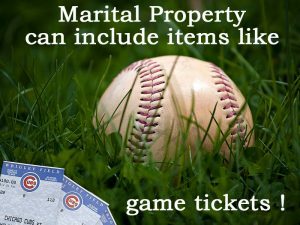 The emergency was that her soon-to-be ex-husband had tickets to the Chicago Cubs against the Cleveland Indians in Game 5 of the World Series. He planned to take their 12-year-old son to the game. Both John and Nancy were loyal Cubs fans. Nancy Riddle held that the situation was an emergency because the Cubs had not taken part in a World Series in 71 years, and if she did not get to see them now, it was likely that she would never have another opportunity.